Garramilla Boulevard will provide a new entry point to Darwin’s CBD. The project will also complete the duplication of Tiger Brennan Drive, from Dinah Beach Road to McMinn Street. This is a landmark project that will help unlock the potential of the city’s eastern end. Garramilla Boulevard will connect Tiger Brennan Drive to Cavenagh Street. This will assist with distributing traffic throughout the CBD. The Boulevard will have a tropical, inner city feel and support development in Darwin CBD. Garramilla Boulevard formerly known as Barneson Boulevard. The Northern Territory Government renamed the Boulevard to its Larrakia name Garramilla. Larrakia Development Corporation advised the word Garramilla has a significance for Larrakia people. The word refers to the white stone that appears in the cliff-faces around Darwin Harbour. A map of the project (10.1 mb) is now available to download. Throughout construction the Northern Territory Government will be issuing construction updates. To be included in the distribution list, provide your email address to communications.dipl@nt.gov.au. If you have any queries or concerns about the project, please email transport.planning@nt.gov.au or call 08 8924 7118. The below traffic modelling information sets out the 'level of service' road performance criteria and provides information about the ratings of roads on Darwin’s road network. Creating and growing a shaded boulevard is essential to this project and will create a cool streetscape with excellent pedestrian and cyclist linkages into the CBD. There will be approximately 200 shade trees planted along the new Barneson Boulevard. The heritage value of Frog Hollow Park will be preserved. Enhancements to public spaces adjacent to the park as well as improved access will open up the space to be enjoyed by many more Territorians and visitors. The Northern Territory Environment Protection Authority (NT EPA) released its decision in November 2017 that the potential environmental impacts and risks of this project are not so significant as to warrant further assessment by the NT EPA and that potential impacts and risks can be managed by DIPL through appropriate mitigation and management actions. To read the full NT EPA decision download the decisions and statement of reasons. Soil, groundwater and surface water sampling by GHD Pty Ltd was undertaken in late 2017 to investigate the nature and extent of any contamination, and to develop management options. GHD concluded that due to the low levels of contamination present, the limited excavations proposed for the project, and the recommended mitigation measures, the contamination represents a low risk to the road construction project, people and the environment. A plain-English summary of the investigation (2.3 mb) is now available. In late 2017, community input was invited on the landscaping and public space enhancement. 64,000 people were reached across a number of mediums and approximately 1,000 people engaged with the consultation project either by visiting the website, engagement on Facebook or at a community information stall. Download a copy of the consultation report (1.6 mb). In December 2016 - February 2017, consultation was undertaken on the development of concept designs for Barneson Boulevard and Tiger Brennan Drive. 152 surveys were completed, 3,200 homes and businesses were letterboxed, 304 people attended information booths, 21 face-to-face meetings were held, 11 written submissions received and 40,000 people were reached via Facebook. Download a copy of the consultation report (19.4 mb). In early 2015 consultation occurred with twelve directly impacted stakeholders through a targeted engagement project which was expanded later expanded upon to include the general public. 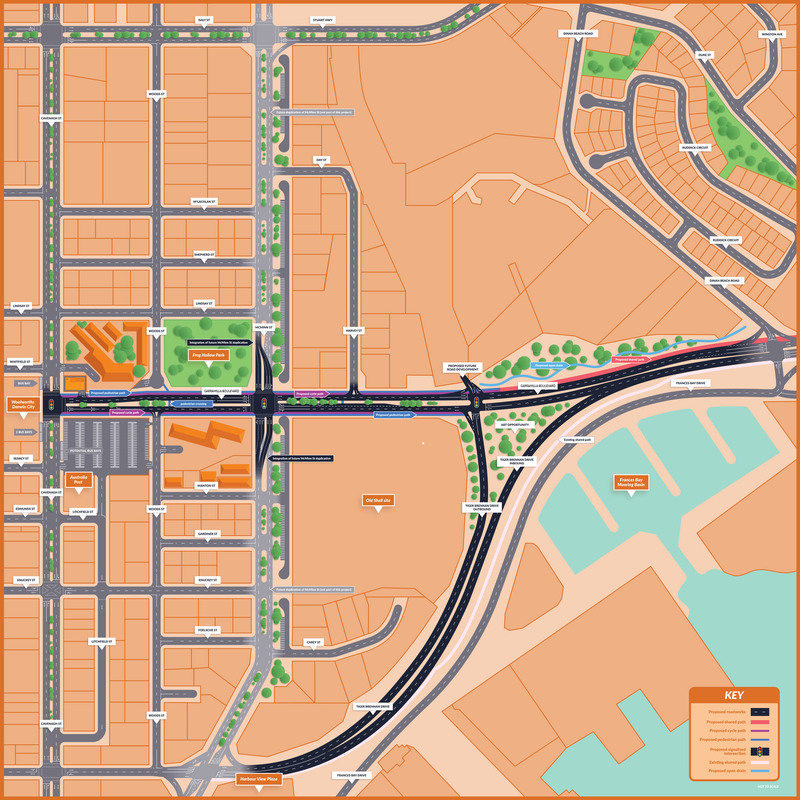 The general public were also included in early planning for Barneson Boulevard in 2013 as part of the Darwin City Centre Master Plan development process led by the City of Darwin. City of Darwin is contributing $5 million to the Barneson Boulevard and Tiger Brennan Drive Stage 3, with the Australian Government contributing $29.53 million and the Northern Territory Government $5 million. Northern Territory Government in October 2017 compiled a report to provide clarity and sufficient information for City of Darwin to be able to confidently support the Barneson Boulevard project as an iconic, green infrastructure project that will breathe life into this part of the CBD. The report to City of Darwin (18.9 mb) is now available.